New York, NY, Nov. 10, 2017 – LeddarTech has been named a CES 2018 Innovation Awards Honoree in two prestigious categories for its LeddarCore LCA2 solid-state LiDAR IC: Embedded Technologies, and Vehicle Intelligence and Self-Driving Technology. 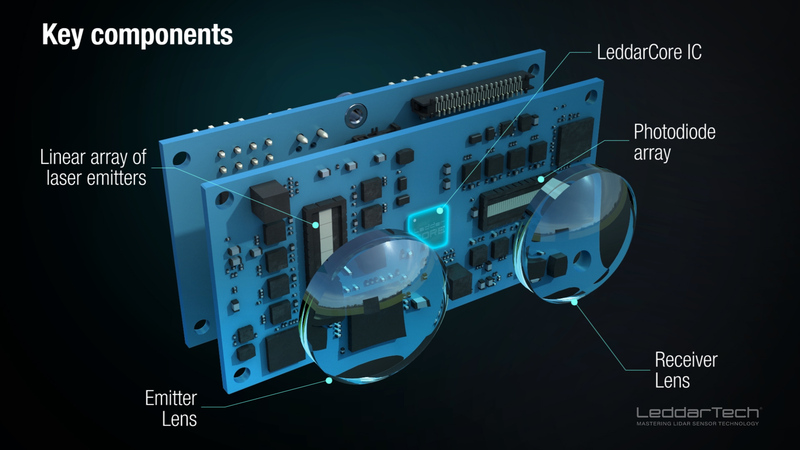 The LeddarCore LCA2 is the world’s first LiDAR integrated circuit (IC) enabling rapid high-volume deployment of solid-state 3D LiDARs that meet the automotive industry’s stringent performance, cost and reliability requirements. By integrating a powerful, proven, discrete solid-state LiDAR (SSL) technology into low-cost ICs, the LeddarCore LCA2 solves one of the industry’s most pressing challenges: enabling rapid, large-scale production of automotive-grade SSLs at an affordable price for commercial deployment in mass-market vehicles. “The LeddarCore LCA2 truly is a breakthrough innovation that brings LiDAR technology to the mass markets. The LCA2 delivers unique added value, reduces inherent risks at all levels of the value chain, and accelerates the path toward commercial deployments of semi- and fully autonomous driving solutions,” said Charles Boulanger, LeddarTech’s CEO. “These two CES awards are an acknowledgement of our technology excellence and LeddarCore IC business model geared toward mass production of SSL sensors by Tier-1 manufacturers for deployment by automotive OEMs as early as 2020,” he adds. The CES Innovation Awards recognizing achievements in product design and engineering are sponsored by the Consumer Technology Association (CTA)™, the owner and producer of CES 2018, a global event covering all business of consumer technologies. Products chosen as CES Innovation Honorees reflect innovative design and engineering in some of the most cutting-edge tech products and services coming to market. The products entered in this prestigious program are judged by a preeminent panel of independent industrial designers, independent engineers and members of the trade media to honor outstanding design and engineering in cutting edge consumer electronics products. LeddarTech is the developer and owner of Leddar, a patented solid-state LiDAR sensing technology that constitutes a novel approach to light detection and ranging. Developed over 10+ years of R&D, Leddar is a unique combination of advanced light wave digital signal processing and software algorithms that enable the production of solid-state LiDARs delivering superior performance and reliability at a highly competitive price. LeddarTech sensors are used in multiple mobility-related markets including automotive, intelligent transport systems, drones, and industrial vehicles. Its technology contributes to improving our safety and quality of life through applications minimizing the risks of accidents, reducing traffic congestion, and improving transport efficiency.